A prequel series to the number one bestseller in Japan. Humankind is down to just a few thousand people who live in territory surrounded by three concentric walls. The walls protect them from their enemies, the ravenous giants known as the Titans. The Titans appear to have only one purpose: to consume humanity. 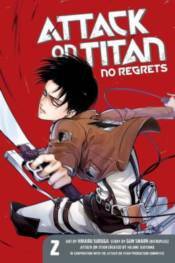 This prequel tells the story of how humanity's greatest warrior, fan favorite Levi, got out of the slums and into the Survey Corps. Story Locale: The post-apocalyptic future Series Overview: Humanity has been devastated by the bizarre, giant humanoids known as the Titans. Little is known about where they came from or why they are bent on consuming humanity. Seemingly unintelligent, they have roamed the world killing off humankind for years. This prequel story to the main Attack on Titan series tells the origin of humanity's greatest warrior and fan-favorite character, Levi.